Your wedding reception is a major part of your wedding. It’s the “social” part of the day, and your guests will be looking forward to the food, alcohol, and dancing. That is why choosing the right wedding caterer is so important. There are two things your guests will remember: the quality of the food and the service. You want both to be impeccable at a price that fits your budget. A good and experienced wedding caterer can ensure that everyone has the best possible time at your wedding reception. And you want to get the most for your money. When you find a caterer with whom you “click,” the event is bound to be a huge success. When hiring your wedding caterer, channel your inner Trump and negotiate yourself the best possible deal. Remember that you are doing the hiring and you are the boss. For ideas how to plan the perfect wedding reception, check out these photos. 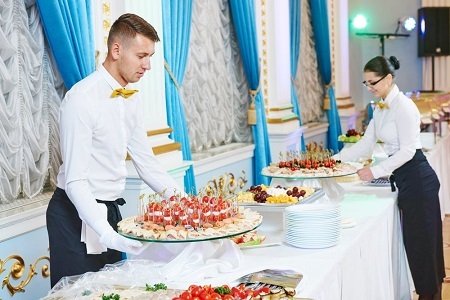 Here are some of the things to look for in a catering service that can assure a successful event. If your wedding venue provides a caterer in its wedding package deal, you have less room for negotiation. Nevertheless, you still have some bargaining power. Remember, there is always room to negotiate. If your venue does not include catering, you will have more choices. However, don’t hesitate to ask the venue for catering recommendations. You can take comfort in knowing that a venue has dealt with certain vendors in the past and have been satisfied with the level of service. Don’t even consider interviewing a wedding caterer before you have your budget and guest list in place. This will allow your candidates to offer you a number of per-plate options within your price range. You should also know the type of catering you need. Seated versus buffet will affect the price of the meal. If you are unsure, the caterer can provide options for both. 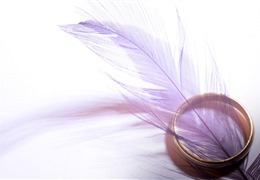 Discuss your dream wedding and see what suggestions he or she is able to make. A good wedding caterer will know how to best turn your random thoughts into a dream event. Every caterer will promise the best food. 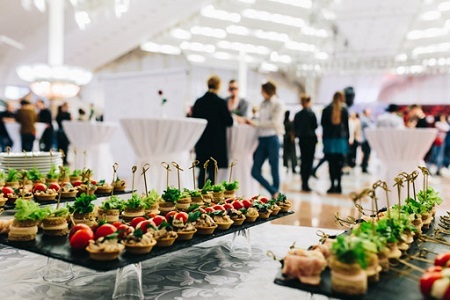 While you will be judging the food at a tasting before making a final hire, there are other things to look for in a catering company. Regardless of how well-recommended the wedding caterer, or how beautiful their website, you should interview at least three to four candidates. Be very sure to compare specifics. How much staff will be involved? 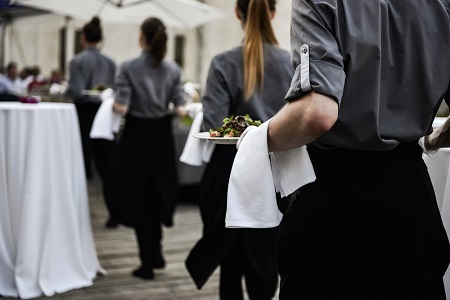 The number of waiters and bartenders can make a huge difference between smooth service and guests having to wait 15 to 20 minutes for a drink or their food. Discuss the caterer’s experience. How long have they been in business? Do they have a specialty? If you have your heart set on a barbeque, and a particular wedding caterer is well-known for its French cuisine, the quality of the food really won’t matter. This wedding caterer probably won’t be able to fulfill your vision. Take note of how each catering candidate responds to your requests, phone calls, and emails. If they do not return phone calls and emails promptly, how much of a priority are you to them? It may sound rude, but don’t hesitate to ask for pictures of the catering staff wearing their uniforms. You want well-groomed professionals servicing your reception. 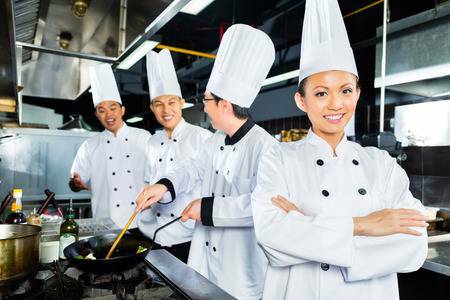 Ask about their experience and how long they have been employed by the caterer. A good wedding vendor is focused on you. He or she should listen carefully to your ideas. Then he or she should ask the right questions to get a full understanding of the big picture and the type of wedding you have in mind. 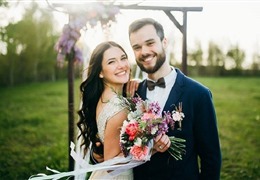 If the caterer is too busy expounded his or her vision for your wedding reception, this wedding caterer has less interest in what you want than in getting a job. Not all wedding catering companies provide food tasting prior to having a signed contract. The question is, how can you sign a contract before you’ve tasted what they are offering? Pretty pictures aren’t enough. If you really love a particular catering company and their menu, all hope may not be lost. Wedding caterers frequently serve samples at bridal expos or hold regular dinners to entice prospective customers. Get your caterer’s event schedule and attend one or two of their events. It will be worth the cost of admission. If the company doesn’t host events and you still love the menu, sign a contract BUT insist on a clause that allows you to cancel if the tasting doesn’t live up to your expectations. If the wedding caterer still won’t agree to your terms, it might be best to move on to the next candidate. Another clause you should carefully negotiate is a cancellation clause. It’s not about you and your fiancé breaking up, it that life can throw you a curve and force you to postpone the initial date. 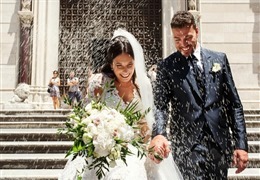 Unless you get a guarantee of at least a 50 percent refund if you cancel within 30 days of the wedding, perhaps you should consider not signing the contract. However, in such an event, you probably will forfeit your deposit. Price will be one of the most important elements of your discussion with a caterer. Caterers usually talk in terms of “cost per person.” However, it isn’t always clear what is and is not included in the stated price. Ask the right questions to get everything spelled out. Otherwise, you may be unpleasantly surprised at the final bill. Is gratuity included in the number given? Is there a charge for having the appetizers passed around? Is there an added charge for cake cutting and corking per bottle? How do they handle unexpected and extra guests? What are the charges for set-up and clean-up? Is soda, coffee and tea included in the per person price? While price is an important factor, it doesn’t have to be your final determinant when selecting a wedding caterer. There are ways of reducing the cost of a meal. If you like the caterer but can’t deal with the $80.00 per plate for a steak pricetag, discuss doing gourmet hamburgers instead. Guests will notice presentation and service more than the specific type of food being served. Before making your final decision, ask the final two contenders for at least three references. 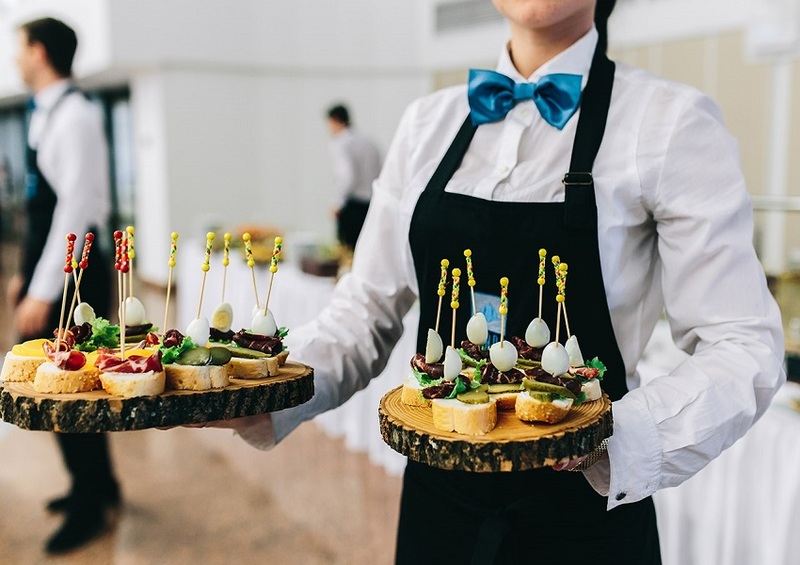 When calling the references, be sure to ask what the wedding caterer could have done differently to improve the event. Also, ask for one reference where the wedding caterer encountered unexpected problems. Ask the caterer and the reference how the problem was solved (You may not get the same answers from both parties). Negotiate like a boss. Once you have all the information you need, narrow your selection to the final two. Why? Because you’re a boss, and if you don’t like a particular deal, you want to be able to walk away with a smile. You will be able to negotiate more confidently when you know you have another option in the background. Remember, no price is set in stone. Start with a low number, which the wedding caterer will raise, until you compromise on a final price. Never, ever, accept the initial price set by the caterer. If they want your business, they will be flexible as long as you remain reasonable. A caterer can add so much to your dream wedding, you want to make sure you hire the right person for the job. You will be glad you made the effort.